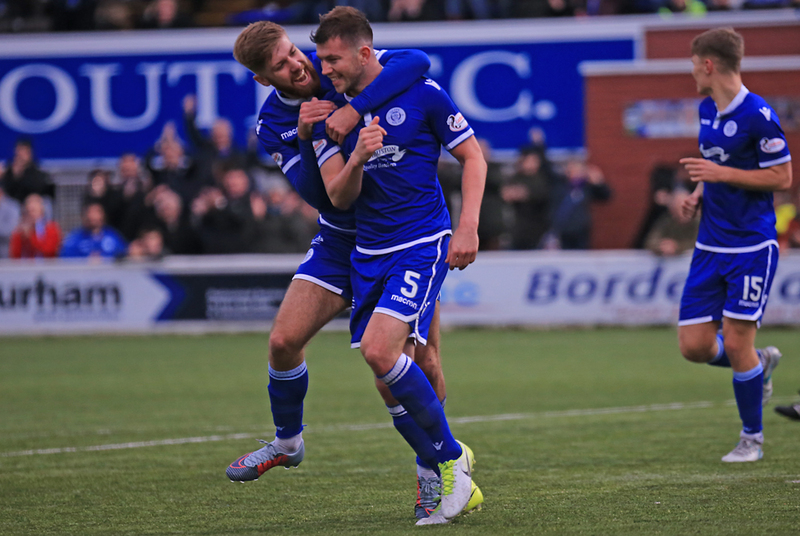 After waiting six games to record a win, Queens made it two wins in seven days as we claimed all three points by beating a struggling Falkirk side by 4 goals to 2 in what was an entertaining clash at Palmerston. The visitors - with only a single league win this season - began brightly, but two quick fire goals slightly against the run of play had Queens in control, and when we added a third the result seemed confirmed. However, when Falkirk rallied late on and reduced the deficit, a sense of doubt started to creep in, but thankfully the last goal of an intriguing clash went the way of Queens as we recorded back to back league wins for just the second time this season. 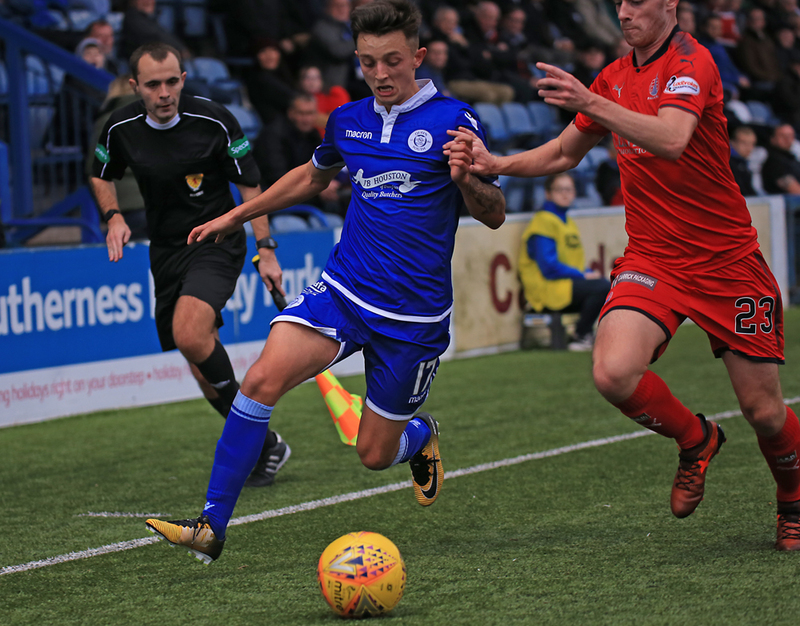 After having had last weekends red card decision overturned, Jason Kerr lined up in a defence that showed just one change to the one that began at Brechin as Jordan Marshall`s injury kept him out of the team for the first time this season. Marshall`s misfortune allowed Scott Mercer the chance to step in and make his first league start of the campaign, and that enforced change was Gary Naysmith`s only alteration as we lined up in a 4-4-2 formation. Visitors Falkirk included former Queens players, Robbie Thomson, and Mark Kerr, in their line-up, as new boss, Paul Hartley, looked to find the way of securing just a second league win of what has so far been a very poor start. In fact it was the visitors who started the game on the front foot with both Kerr and McKee prompting well from the midfield, and the pair created the game`s first half chance for Austin who was unable to keep his effort on target. A foul by Kyle Jacobs on McKee gave Falkirk a free-kick that eventually fell to McGhee, but from just inside the penalty box, his low drive went well wide.In those opening few minutes, Queens had struggled to have any meaningful possession and young Falkirk winger Cieran Dunne - making his full debut - was causing problems down the left wing and on several occasions his pace allowed him to get to the byeline and cross, although both Darren Brownlie, and Jason Kerr were able to defend the area pretty comfortably as Falkirk were not able to find the finish to some good approach play by the youngster. After being on top in the open stages, suddenly in the space of 3 minutes Falkirk found themselves two goals behind and the first of which was a goal of their own making. 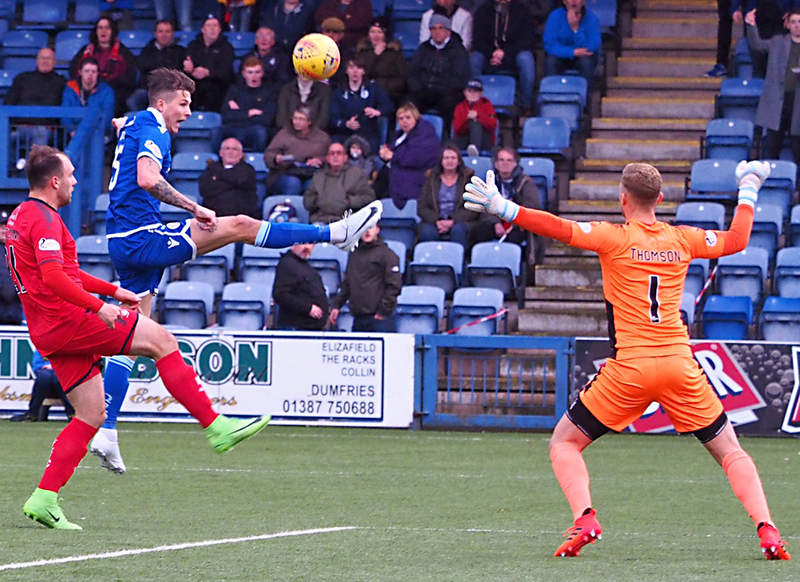 A sloppy, and under hit back pass had `keeper Thomson struggling, and as the ball was chased down by Stephen Dobbie Thomson`s clearance hit the Queens striker who then got a favourable bounce and was able to prod the ball into the empty net. The goal was Dobbie`s first in the league since his hat-trick against the same opposition back in August, and more surprisingly his first home league goal of the current campaign. That opening goal was swiftly followed by a second for Queens as the hosts took full control of the game. Scott Mercer`s challenge and then forward pass was flicked on by Dobbie into the path of Lyndon Dykes and from a very acute angle his lob looped up over the stranded Thomson and found the far corner. Boosted by the goal, Dykes grew in confidence and he threatened to break clear and get a run on goal but his movement was crudely halted by Balatoni who was booked for his challenge on the Aussie striker. Falkirk reacted well to going behind and would have reduced the deficit almost immediately, but Alan Martin produced a fine close range save to keep out Craigen`s diving header. A goal at that point would certainly have given the away side plenty of encouragement but as it was, it was Queens who came very close to adding a third goal. 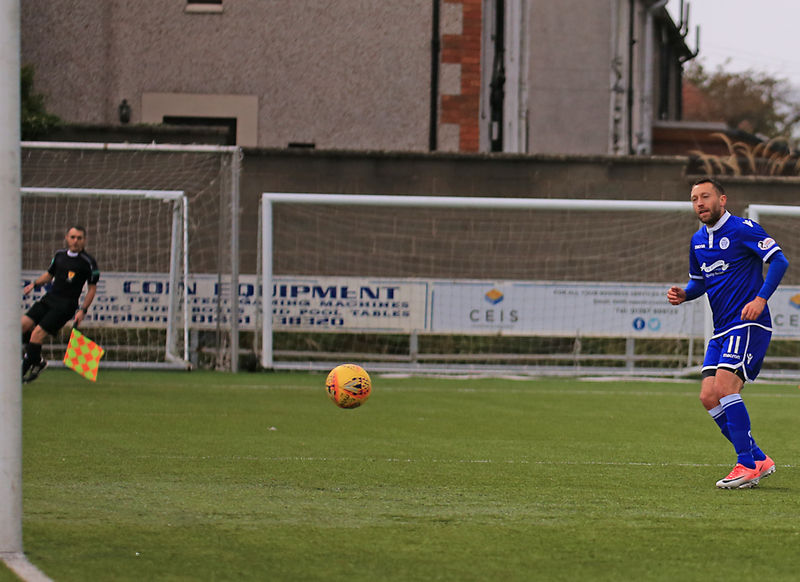 A long ball from Callum Fordyce picked out Dobbie`s run down the right and his first time cross was only inches away from connecting with the head of Dykes who had made up ground to take up a good position. Just past the half an hour mark Falkirk had their best chance of the half and it came as no surprise to see that Dunne was once again involved in the move. His pace and direct running allowed him to deliver a really inviting ball into the six-yard box, and with an open goal beckoning, Austin failed to apply any touch that would surely have forced the ball into the net. Minutes before the break another run and cross from Dunne had no takers as once again fine build up play went unrewarded. A foul on Dykes gave us a free-kick mid -way inside the Falkirk half, and Dobbie`s deflected effort from the set-piece won another corner that eventually fell to him some 8-yards out, but with his back to goal he was unable to work himself into a shooting position, and Falkirk cleared the danger. 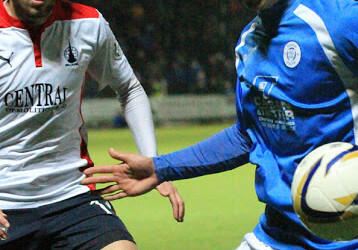 A superb one touch passing move that began with Dobbie and involved Murray and Dykes won Queens another corner moments from the interval and although James McFadden produced a pin-point delivery, both Kerr, and Brownlie both went for the ball and as a result neither made a good enough connection to keep the ball on target. The final action of the half saw the visitors win a corner, but resolute defending from a confident Queens rearguard enabled the team to leave the field to a standing ovation from those in blue in the crowd of 1716. 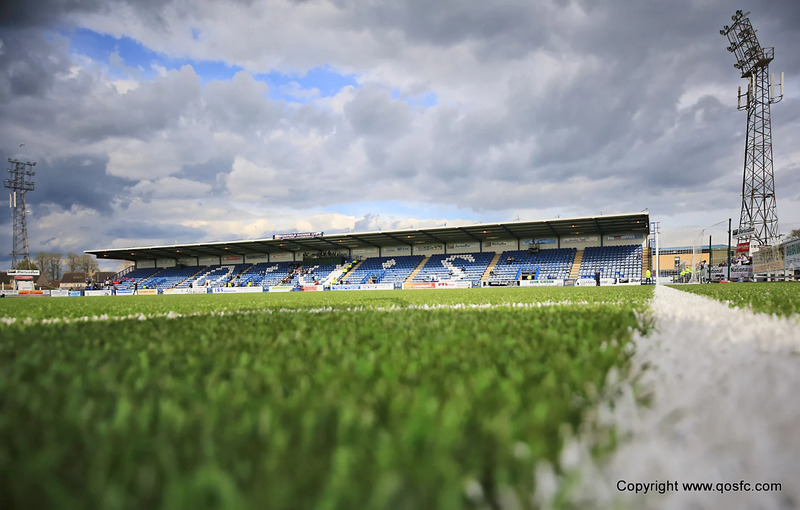 Visiting boss, Paul Hartley, made two changes at the break, introducing strikers, Loy, and Miller as the visitors looked to find a way of getting back into the game, but almost straight away it should have been game over as Queens missed a really good chance to put the game to bed. Superb link-up play between McFadden and Dobbie created a chance for Dobbie, but `keeper Thomson had got his angles correct and offered Dobbie little to shoot at and blocked the effort well. At the other end a half chance fell to Craigen, but Martin saved comfortably enough. The two substitutes were offering a bit more movement up front for the visitors, but again their most threatening attacking player was young Dunne and after getting on the end of Muirhead`s cross, he wasn`t too far wide with a low drive. 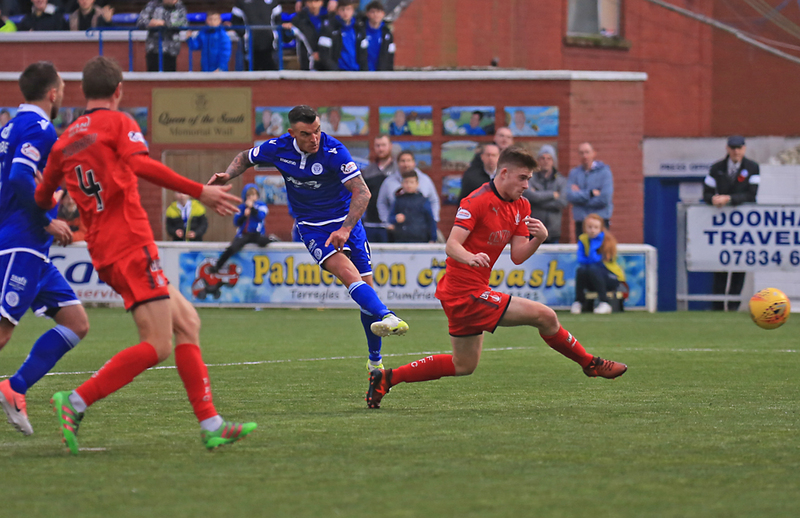 Queens youngster Connor Murray came close to scoring his first goal when put through by Lyndon Dykes` neat flick, but caught in two minds he elected to shoot - possibly a fraction early - and only succeeded in lifting the ball straight into the `keeper`s arms. Another promising attack saw Queens win another corner and after bouncing around inside the box, the ball finally fell to Dobbie at the back post, but his hurried shot flew wide of the target. Queens were forced into making a change just before the hour mark as Scott Mercer hobbled off to be replaced by Shaun Rooney, meaning a switch from right to left back for Callum Fordyce. Top league goalscorer, Derek Lyle replaced McFadden on // minutes as once again the former Scotland striker showed some impressive reading of the game as well as linking play effectively, especially with both Dobbie and Dykes.The visitors got themselves a shooting opportunity from a free-kick after Brownlie`s challenge was deemed to be a foul, but although McKee`s strike was on target, Martin dealt with the shot easily.Earlier in the half Murray had the chance to score his first Queens goal and in the next attack he went even closer when his curling right foot shot from just inside the area was superbly tipped away by Thomson. The third goal for Queens arrived with 15 minutes left. A shot across goal was deflected for a corner on the right and although Murray did not make the scoresheet, he will be able to claim an assist as his perfectly delivered corner was met by the head of Darren Brownlie who guided the ball past Thomson. That really should have been that but with the points seemingly in the bag, Queens switched off and allowed the visitors to make a fight of what should have been a really comfortable closing 15 minutes. We started to play some sloppy and careless passes which encouraged the away team to be much quicker about their play. Our final change saw Murray replaced by Callum Tapping as Falkirk went close to pulling a goal back when McKee`s curling free-kick went close.Shaun Rooney finally found a way to stop the impressive Dunne by pulling him back, earning him a yellow card in the process, and then with five minutes left a goal for the visitors did arrive when McKee`s free-kick from wide on the left evaded everyone and flew past a slightly unsighted Alan Martin. That was the first league goal Queens had conceded in over 385 minutes, and just four minutes later after a moment of panic in their defence they conceded again when McGhee headed home Dunne`s excellent cross. Surely we would hang on for the win, only seconds to go as Falkirk launched another attack and memories of a game against Partick Thistle came flooding back, but thankfully and finally the win became a certainty when Falkirk having thrown everything into one last effort, got caught by a fast break from Queens and Derek Lyle was well placed to drill the ball past Thomson to wrap the game up. Sponsors chose Connor Murray as the man-of-the-match and the win sees us move closer to the play-off spot after what was a pretty convincing victory....in the end !! 14:51 Falkirk xi; Thomson, McGhee, Muirhead, McKee, Kerr, Austin, Hippolyte, Balatoni, Gallacher, Craigen, Dunne. 3 min Early attack for Queens but Dobbie can`t get on the end of Dykes` through ball. 7 min Austin`s first time effort flies over the bar. 8 min Pressure from the hosts earn Queens the first corner of the match. 9 min McFadden`s corner is cleared to safety. 14 min Not much to report here at the moment. 18 min Thomson hits the ball off Dobbie and it falls to the striker to tap into the empty net. 1-0 Queens. 19 min Dykes lobs Thomson from an incredibly tight angle. 2-0 to Naymsith`s men. 21 min Balatoni fouls Dykes on the half-way line and referee Steven Kirkland goes to his pocket for the first time, hands him a yellow card. 23 min Martin pulls off an incredible save to deny Craigen. 34 min Dunne whips in a tasty delivery from the left but Austin can`t connect. Still 2-0 Queens. 41 min Dobbie`s long-range free-kick is deflected out for a corner. 44 min Great work between Dykes and Dobbie ends with the ball out for a corner. Good first half performance from the South. 49 min After a great move involving Dykes and McFadden, Dobbie`s shot is well-saved by Thomson. 50 min Loy`s low shot is saved by Martin. 56 min Falkirk win a corner. 58 min Dobbie misses from close range. 63 min The defender is booked for a late challenge on Dykes. 69 min Martin makes a superb save from a free-kick. Queens break and Murray curls a superb effort which is denied by Thomson. 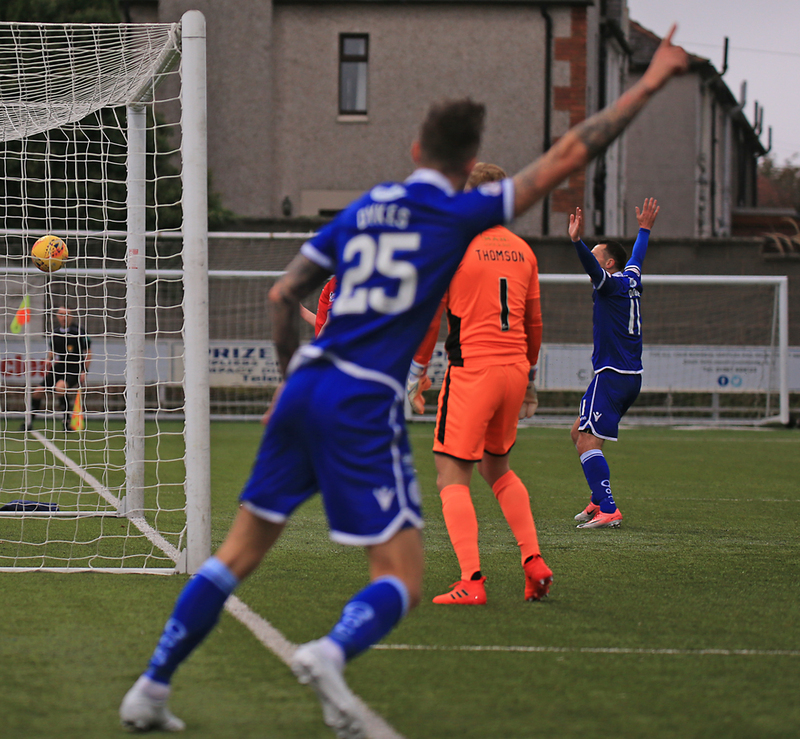 75 min Queens win another corner, Dobbie`s cross is deflected out for another set-piece. Good pressure. 78 min Brownlie`s header all-but wraps up the points for Queens. 87 min McKee is the Falkirk goalscorer. 88 min McGhee is the Falkirk goalscorer. 90+1 min McGhee gets the second for the Bairns and it`s well and truly game on here now. 90+2 min QUeens break away and Lyle finally wraps up the victory.